You are currently browsing the CrackedActor.com – a David Bowie fan site weblog archives for February, 2008. Other guests on the album include Nick Zinner of the Yeah Yeah Yeahs on guitar. I’m a little skeptical of the album itself because I’ve heard Johansson sing and while she’s not horrible, she’s not spectacular. Maybe the thinness of her voice is due to the poor sound quality, but I’m still not convinced she’s a great singer. Of course I’m still going to get the album and give myself a chance to like it because Bowie is featured and I kind of like Johansson but also because she apparently has cool taste in music. I mean, an album of Tom Waits covers? That is cool. Update: Bowie commented on his contribution to ScarJo’s upcoming album on today’s BowieNews. He also essentially said her vocals are pretty cool. As far as recommending artists that I like, he’s got a pretty good track record so I’m looking forward to hearing her sing a bit more now. I’m a Bowie freak. And a sci-fi geek. So what is the next best thing to having David Bowie direct (or star in) a sci-fi movie? Having his son direct it! It’s doubtful that he’ll be credited as Zowie Bowie but nevertheless Duncan Jones is directing Moon. Due out in 2009, Moon tells the story of an astronaut stranded on the moon for three years and stars Sam Rockwell as the marooned astronaut. After Rockwell’s performance as Charley Ford in The Assassination of Jesse James by the Coward Robert Ford, I am really looking forward to this movie. Okay, and Rockwell’s skills aside I’m also dying to see the directorial debut of Bowie’s son…..and whether or not the main character will be named Major Tom. What is it with the Bowie/Jones family’s fixation on abandoned space travelers, anyway? 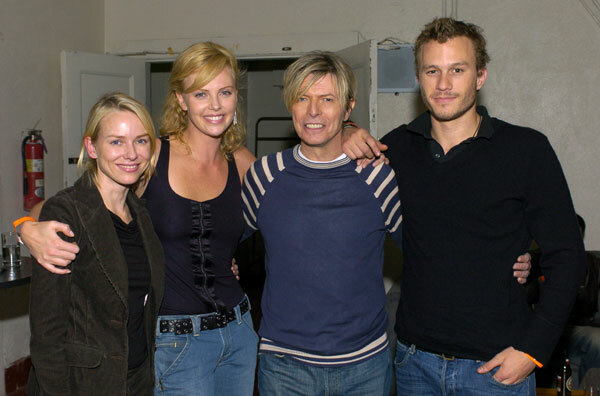 Bowie with Heath Ledger, Charlize Theron, and Naomi Watts in 2004. Rest in peace, Heath. 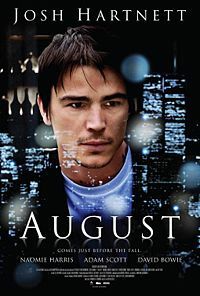 I cannot wait to see August. In an interview with the New York Daily News, Bowie’s “August” co-star Andre Royo commented that Bowie took the time to learn his lines which made Royo and the rest of the cast “feel great because there’s someone iconic who’s taking it seriously. This is David Bowie. He could have said, ‘Listen, I don’t give a f-. I’m David Bowie. You didn’t cast me because I’m a thespian of the ages. '” (Incidentally, that makes me wonder if a lot of high-profile actors who do cameos don’t bother to learn their lines.) I know I’ve said before that I don’t think Bowie is the best actor, but he was amazing in “The Prestige” (and should have gotten an Oscar nomination for Best Supporting Actor) so I hope he follows up that flawless performance with another. The people at Page Six for the New York Post spyed Bowie and Iman at Kara Walker’s exhibit earlier this month. If you are not familiar with Walker and her work, the you ought to check her out. I first heard of her when VOGUE wrote an article about her work. She’s known for dealing with race and gender in a larger-than-life fashion.